Overall cleaner alignment and consistency across all screens. Screens renamed for clarity, pertinent fields brought to the forefront, font scaling, font color, text changes, etc. Quality of life improvements on navigation. Main screen watts increment changed to 1 W instead of 0.1 W.
Main screen temp increment changed to 10 degF instead of 1 degree increment. New Profile default screen cleanup and simplification. 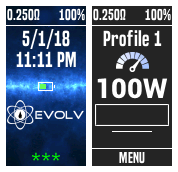 Profile screen fully displays all options for the coil, including resistance locking, re-reading, temp protection setting, etc. Monitor screen now includes new Statistics screen with reset option. Monitor options to toggle recording of all possible variables. System screens split into a Display screen and a Settings screen exposing all possible device settings. About screen now displays device firmware and edition, with place to list owner name and phone number. New Performance screen for dynamically monitoring and adjusting temperature control. Displays current atomizer settings, as well as live view of live ohms, room temp, last puff time, wattage, average and max temp achieved. Boost added to preheat screen for international firmware. Replay functionality added to main screen for international firmware. Profile screen includes ability to enable or disable Replay. Per-profile setting. Each subscreen shows icon at bottom-right indicating that profile is Replaying last puff. This is a very nice theme, there are a lot of options to customize. It is a little confusing at first, for example, when you try to change the profile from the main screen, it sends you to a performance page, where you still can't change your profile, only the material. So when I have my Ammit on and I switch to my Limitless, if I select 'Ammit' from the main screen and want to switch to the Limitless profile, it takes me to Performance, and there, I can only change the material type, not the profile. It's a very minor thing, and I can always go to Settings>Profile and do it there. That is one con, and could probably be changed in the theme editor. Other than that, I love the options available to customize. There are a few places that you can change the temp and the wattage, as well as the material you can easily lock the ohm setting or change it. Everything is laid out nice and smooth, easy to read and navigate, this theme makes it to where I hardly need to hook to Escribe to change things, so I am giving it 5 stars. I feel like it would be hard to top this theme and I am looking forward to seeing if anyone can come up with something better than this. I don't know enough about DNA devices to know exactly what to check for and why, but this theme has made my DNA experience very worthwhile. My go to theme!! Keep us updated if any changes! Thanks! This is my go to theme. I like the organization of the screens. V3 seems to be an even 'cleaner' theme style. 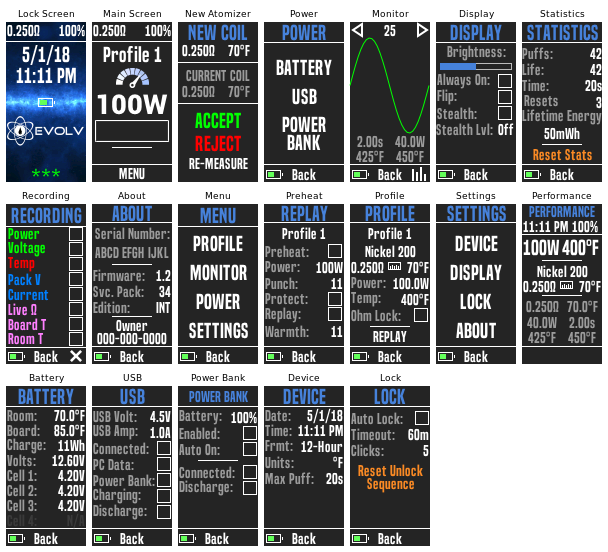 Not only is a material-based theme where you only have to change the material to Vape on the main screen, but still have access to the profiles under the settings menu. love the look and feel but i placed owner info on the lock screen not everyone would be able to or know where to find it if lost.